If you have a huge Photos library on the Mac, you very likely have a bunch of duplicate photos. People have also found that duplicates photos are sometimes created when you upgrade from iPhoto or Aperture to Photos. Unfortunately, if you look at the “free” programs on the App Store, you find that they are generally either scams or teasers for a paid version. Once the script finds any duplicates, it creates a folder called “Duplicates” and adds a new album with the found duplicates. You should then go through that album and confirm that the duplicates are legitimate. If they are, select which the one duplicate you want to remove (you won’t want to get rid of the entire pair, presumably), right click and select delete. Make sure you don’t delete both in the pair, but if you do it’s not the end of the world; they will stay in the deleted photos album for a month. Let me know if something doesn’t work right. The Photos AppleScript library doesn’t allow any destructive operations other than deleting albums (which I don’t do in either script) so the worst case should be that if it doesn’t work it just doesn’t find duplicates that it should. Update: As a couple folks pointed out in the comments, the next step will be to create a script that allows you to “merge” a pair of photos, moving all the album associations and tags onto just one. I haven’t looked into whether this can even be accomplished with the Apple Script hooks available in Photos, so if anybody has an insight I’d appreciate it. This entry was posted in HowTo, Photography, Technology on February 7, 2016 by Jonathan. Verizon and Netflix problems resolved by routing around Cogent? By now the problems between Verizon and Cogent are well known, at least to nerds. FiOS users, especially on the East Coast, have been complaining of increasingly poor Netflix streaming performance. The reason stems from the saturated connections between Cogent and Verizon which neither refuses to fix; see here for a good background on the dispute. Basically, Cogent is sending more data to Verizon than vice versa, and Verizon is asking Cogent to pay for the upgrades required. The reason this story has been getting any press is that it highlights the complete insanity of the commercial internet system: ISPs expect to get paid to carry data packets, even if those data packets are requested by their own customers. In this case, Cogent is simply providing Verizon with the Netflix data that Verizon’s customers have asked for. To highlight the ludicrousness of the way the internet operates, Verizon could presumably generate traffic from Cogent for which it expects Cogent to pay by issuing requests to download data from Netflix itself. Or, as Netflix has pointed out, Netflix could resolve this situation by deciding to host its users backup data for them simply to artificially generate traffic going the other way. In fact, I’m surprised that Netflix doesn’t just program its streaming clients to repeat every bit back that they receive. That would solve this ludicrous problem, while also highlighting the stupidity of the way peering arrangements are made. At the bottom of this insanity is the fact that the companies who run networks have decided that they should get paid to carry packets like shipping companies would charge to carry packages. I would say it’s like UPS deciding to charge Amazon for shipping a package, while also deciding to charge the recipient for driving to their street. However, that’s not a perfect analogy, because if it were really like the Internet, UPS would be willing to waive the shipping if I handed them something to send back to Amazon. In fact, I struggle to find an analogy with the physical world of shipping, because there is no good analogy. Which is why it’s so incredibly stupid that network providers insist on billing arrangements that are analogous to shipping contracts. Is it possible that rather than deal with Cogent or Netflix, Verizon has decided to just send East Coast Netflix traffic all the way to servers based in California, and to get there without using Cogent? Or, could Netflix have caused this by having clients make requests to different servers to get around the limited Cogent-Verizon ports? One thing that is clear is that we need a fundamentally different model for commercial internet if games like this are being played. This entry was posted in Technology on March 22, 2014 by Jonathan. One of the saddest consequences of Steven Wolfram’s descent into megalomaniacal insanity (vis his decision to save science from itself by reinventing it in the image of a popular science book from the 1980s) is the continuing decline of Mathematica, his greatest (and, he seems intent upon forgetting, only) accomplishment. Another nice bug is the fact that WeightedAdjacencyGraph[WeightedAdjacencyMatrix[g]] often returns an error, despite the obvious fact that it should return the original graph (at least topologically). Seriously, Wolfram. Are there many more important mathematical topics today than graph theory? 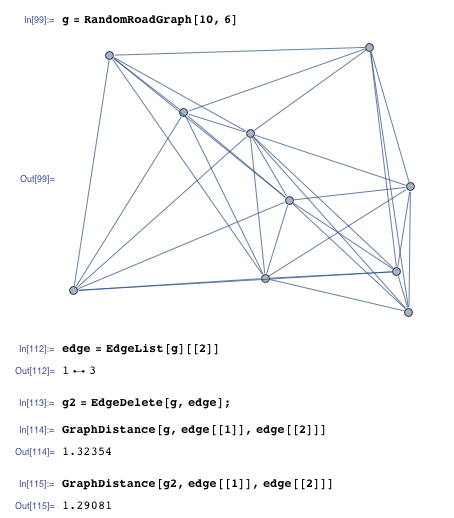 You can’t throw a copy of Mathematica these days (and I plan to) without hitting somebody working on a topic for which graph theory plays a central role. The fact that the interface to Graph is an unholy mess is nothing compared to the fact that it doesn’t even return correct results when things like GraphDistance are applied to a graph which has been manipulated. When Mathematica starts returning mathematically incorrect results, something is wrong with the world. That thing, I believe, is Stephen Wolfram himself. It’s time for him to move on from Wolfram and let somebody else run the show. This entry was posted in Technology on March 20, 2014 by Jonathan. I ran into what is apparently a not uncommon problem with iPhone video: you start to take a video while phone still thinks it’s in portrait orientation (long axis of the phone vertical) and then the rest of the video is stuck that way, even if you took 99% of it in landscape mode (the way God intended). You thus have a video that the Mac always wants to display sideways. If that didn’t make any sense, the bottom line is I had a video I needed to rotate 90 degrees, and maybe you do, too. While there were plenty of solutions available on the PC, tons of Googling turned up virtually nothing for the Mac, short of finding an old copy of iMovie from five years ago. The solution requires a copy of the very nice all-purpose video player, VLC. It should actually open up in landscape orientation, regardless of the erronious orientation data in the movie file from the iPhone. Select “Streaming/Exporting Wizard” from the File menu. Select “Transcode/Save to file” and click next. Use “Existing Playlist” and select the file you just opened below, click next. Leave everything untouched (i.e. both check boxes blank) on the transcode screen and click next. Click the button to tell VLC where to put the output file, then click next. This should be all it takes. The process will be fairly quick, since there’s no transcoding, but its not instantaneous as it does have to move a lot of bits into a new file. This entry was posted in Technology and tagged iphone, osx on March 30, 2011 by Jonathan. For some reason I decided to take a look at the top 50 most played songs on my iPod. Here they are, listed from 5 to 1. One guess as to which two songs are Alex’s favorites? This entry was posted in Random on February 11, 2011 by Jonathan.